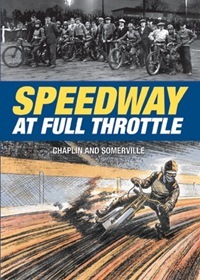 "Speedway at Full Throttle" combines the words of John Chaplin with pictures from John Somerville's unrivalled collection of speedway images. The pair regularly contribute to Speedway Star magazine via their "Museum Piece" column, which is the inspiration for this book. The book features 57 chapters, each on a different speedway subject or rider, with a beautiful epilogue in tribute to Dave Lanning completing the work. The whole book is dedicated to Lanning, who passed away last year and who is described here as "The Voice of Speedway". The chapters vary in length, some spanning many pages and others just a single page. The format works well, allowing many short (and often humorous) stories to be intertwined with more detailed character studies of some of the sport's biggest names. Although the focus is primarily on the Pre-British League era, there's plenty of more modern content included also - Dennis Sigalos, Peter Collins and Bruce Penhall rub shoulders with the likes of Smiling Jim Kempster, Ron Johnson and Ken McKinlay. It's very much a celebration of the sport, picking out great characters and stories from through the years and Chaplin's writing breathes fresh life into some long forgotten tales. One suspects that Chaplin knew many of his subjects personally and was eye-witness to most of the incidents described in the book. This certainly isn't a book that simply regurgitates hoary old anecdotes, it's written from the head and from the heart, probably without any great need to refer to other sources. The dark side of the sport is touched on with a chapter dedicated to American rider Ernie Roccio who was killed in a track crash at West Ham in 1952. One of the most interesting chapters actually relates to a rider who didn't make a huge mark on the sport at all - Russell Paine. Russell was a journeyman rider himself but has spent recent years trying to help others to get into the racing side of the sport. This included a determined attempt to open a new track in Spain and the tales he shares of those times are incredible. Chaplin's prose would make a great book in itself, but mixing it with pictures from the John Somerville Collection lifts this production to another level. Hundreds of beautifully reproduced black and white images fill the pages, generally captioned with some interesting little nugget of information. There's a good chance your local book shop will have this in stock. If you're not able to find it (or just prefer to have things delivered directly) then it can be ordered from Halsgrove Publishing for £19.99.